If you happened to Google “Tesla autopilot” in the last 24 hours, you were greeted by an inundation of headlines that suggested the automaker’s famed feature on a driver’s Model X “predicted,” and helped the motorist avoid, a crash. While it’s notable the vehicle did in fact stop, it seems appropriate to remind Tesla owners equipped with Autopilot: Stay focused on the road. As former Jalop and friend of the site Travis Okulski noted at Road and Track, Autopilot’s indeed impressive! But it’s not supernatural. 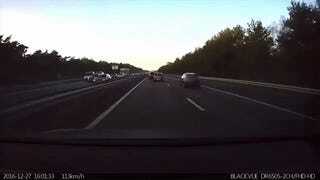 In the video, it appears the driver ahead of the Tesla brakes and gets out of the way before Autopilot realizes what’s up and slows down. It still stopped, which is good! But what happened is Autopilot helped a driver who possibly wasn’t paying attention—one who probably would’ve stopped even sooner had they been otherwise. It didn’t, however, predict the crash. Autopilot, like many semi-autonomous systems, is incredibly fast, but it can’t see into the future. Not yet, anyway. “Predict” is a bit of a stretch. The Autopilot-prediction-but-not-really-a-prediction comes just months after Tesla founder Elon Musk said he wanted to roll out a fully-autonomous, Level 5 Model 3 by the end of 2017. As we reported in October, Musk claims the Level 5 system should be about twice as safe as a human driver, but he said Tesla would take responsibility for incidents involving the failure of Tesla’s system, but wouldn’t follow suit with other companies—Volvo or Mercedes, for instance—in accepting blame for all incidents. “It’s up to your insurance,” Musk said at the time. Put differently, keep your eyes on the road.